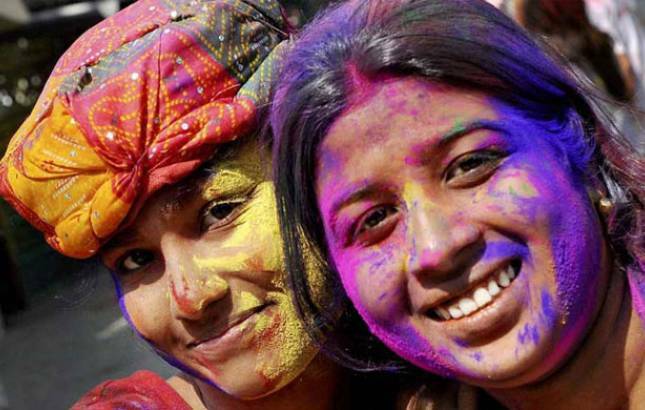 Holi, the festival of colors, marks the arrival of spring. The festival is celebrated with fervor and gaiety and it is all about turning your mates into colorful clowns. On the occasion, throwing colors at everyone is a normal practice as it is way people celebrate the victory of good over evil. Although, the wild colorful party is fun while playing this festival, getting rid of that color might be a problem later on. In fact, many of us find it really difficult to remove that stubborn color without destroying our skin. So, if you too are facing this struggle, here are some beneficial tips which will help you zap off the color. * Avoid using hot water to remove color. Instead, use cold water for colors as it will prevent the colors to sink in more. * Apply a mixture of honey and lemon juice, mixed in equal proportions. This mixture will help to remove the color easily. * Avoid using shampoo soon after playing Holi. Instead, apply egg yolk on your scalp and rinse it after half an hour. You can also use mustard oil to remove the color from your hair. * You can also use coconut oil to zap off the color. Besides, it also acts as a skin moisturizer. * Make a special mixture using honey, papaya and Multani mitti and apply it on the portions with stubborn colors. This will lighten the color. You can also keep the paste and apply it in a series of days.